San Marcos High School’s own indoor practice facility was completed over two years ago and the impact it has had on the students is evident. San Marcos High School’s indoor sports facility. Photo by Russell Ramsey. The facility is filled with equipment that may not have been accessible to the students when they were in middle school. It has over 50 yards of field turf, a fully equipped weight room and the ability to drop two sets of nets and separate the turf into four quadrants. This allows multiple teams to be able to practice during inclement weather instead of just one. The shade combined with the gigantic fans they use creates over 20 degrees difference between standing inside and outside of the facility. The new equipment seems to be catching the attention of student athletes. The participation as the San Marcos F.A.S.T. Camp, the strength and conditioning summer camp, has grown since the facility was built. “We had over 120 athletes over the last two weeks, it has been awesome,” head women’s soccer coach Jason Carnley said. The athletes range from elementary school to high school age and play all different sports. The field turf is marked off on yard lines, but other lines have been painted as well to serve as a baseball diamond, along with drop down batting cages. 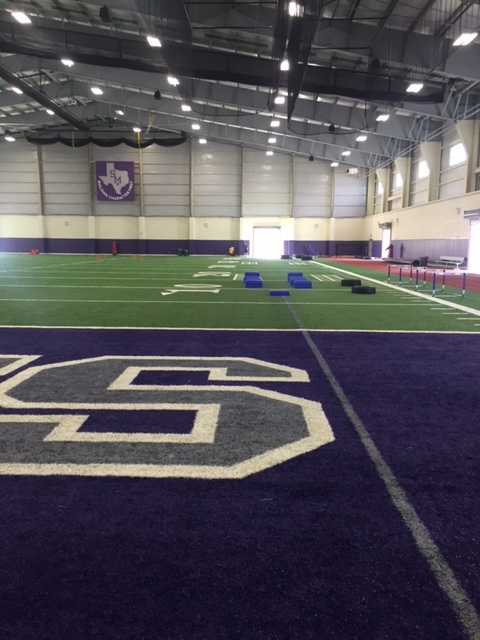 San Marcos High School’s indoor practice facility is extremely versatile allowing for boy and girls of all ages and sports to come together and get better.